(Tap, tap.) Is this thing still on? Sorry I've been awol, I'm hoping to get back to posting more regularly on this site in the near future. In the meantime, I will blogging a bit about the very local Jew vs. Jew conflict over here. Feel free to come on over, and keep checking back here for new content. The negative e-mails started soon after word spread that the Hampton Synagogue was asking the tony Village of Westhampton Beach for a proclamation permitting it to erect an eruv, or symbolic boundary, around the synagogue. There were also those who insisted that “people would not be able to drive cars in the eruv ... and that [Jews] don’t like to walk on sidewalks within the eruv because of the cracks in the sidewalk,” said Clint Greenbaum, a member of the synagogue’s eruv committee. "Allow Jewish people to pass through people's property on their way to temple"? Stopping Christians from putting up Christmas ornamentation on their properties within the boundaries of the eruv? Where do people come up with these unfounded fears? And of course, no article about the encroachment of the Orthodox into a community would be complete without vague, unproven allegations of "Shopkeepers have already been asked rather strongly to please close their stores on Saturday" (previous versions of this canard here). While an eruv doesn't have any of the magical properties its opponents seem to ascribe to it, it does seem to have an almost magical ability to make reasonable people lose their rationality completely. Joel Cohen, a member of the synagogue’s eruv committee, said he agrees that withdrawing the request was a prudent step. Aside from the incongruity of Barack talking to two hasidic men, there is the use of the term in the headline ordinarily thought of as a racial slur: "schvartzer." Of course, the context here is entirely innocuous. 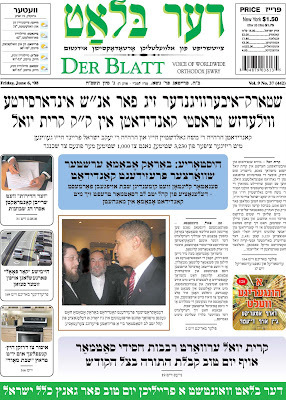 "Schvartzer" is simply the yiddish term for black, and the headline is simply making a factual statement that Obama is the "first black presidential candidate." Whose bright idea was it to run a bunch of little league games on the Sunday of Erev Shavuot??? The whole notion is just so, so wrong. Why is it a wise idea to have people who will be ostensibly pulling all-nighters to learn for Shavuot spend the day leading up to it exhausting themselves by running around coaching/playing ball in 85-degree temperatures? Also, did it occur to whichever shul youth directors or league organizers who planned the little league calendar that perhaps us mothers stuck in the kitchen simultaneously attempting to clean up from Shabbos and cook for Yom Tov might prefer to have an extra couple of pairs of hands available around the house to help out or to run errands? If little league participants can get a week off for the Salute to Israel parade, there's no reason that the kids can't get another week off to properly prepare for the holiday of Matan Torah. There are some games scheduled for 3 PM on Sunday - which means there will actually be games in progress until just a few hours before the Chag begins! It just seems to me to be a poor lesson for our children to be learning. I'm all for kids getting exercise and participating in team sports, but is it absolutely necessary to have them doing so in such an awkward and inopportune time slot? I'm sure not. The whole point behind the Orthodox little leagues is so that games can be scheduled for Sundays instead of Saturdays as in typical leagues, which would preclude Shomer Shabbat kids from participating. The decision to run the games this Sunday hardly seems to be in line with the concept of making the games in any way convenient for Orthodox participants. Which reminds me of a similar situation we found ourselves in this winter. One of the orthokids plays in a popular hockey league in a local Orthodox high school. Games are generally played on weeknights. Somehow, it was decided when the calendar was planned that the Thursday night of Thanksgiving was off-limits for scheduling games, yet there were games scheduled for every night of Chanukah - and even running into the time to light candles, which meant that the whole family had to delay candlelighting until after my child's game. All in all, a poor show of prioritizing for my kids, in my opinion. Assemblyman Dov Hikind yesterday predicted that Jewish voters would make "a mass movement toward Sen. McCain" if Barack Obama knocks Hillary Rodham Clinton out of the race in tomorrow's critical Democratic primaries. Hikind, an Orthodox Jew whose Borough Park district includes the largest Hasidic bloc in the United States, blasted Obama for what he called his half-hearted support of Israel and his ties to the Rev. Jeremiah Wright Jr., who has repeatedly praised anti-Semitic Nation of Islam leader Louis Farrakhan, who has endorsed Obama. Hikind, a Democrat who has yet to endorse a candidate for president, said Obama had not satisfactorily distanced himself from Wright, his Chicago-based personal pastor, noting, "This is a man who thinks Farrakhan is a great guy and God's gift to the world." Hikind went on, "Obama has said that you can be a supporter of Israel even if you're for giving up land to the Arabs, which is true - but for a guy running for president to take a position like this in advance of getting into office, combined with everything else going on in the Middle East, that scares the hell out of me. Huh? It "scares the hell" out of Hikind that Obama says you can support Israel and still be for giving up land for Israel? What world does he live in? Does he think Hillary Clinton feels otherwise?? Most US politicians would admit that any peaceful settlement would include some concession of land to the Palestinians. Does Hikind actually expect Mr. Obama to take a public position on the matter that is to the right of GWB's current position?? And then what? Flip-flop after the election to a position more in line with just about every other politician in the country?? That sounds like a super idea. And did Mr. Hikind somehow miss when Mr. Obama clearly rejected and denounced Mr. Farrakhan, and called him out for being an anti-Semite? That Mr. Hikind feels that Obama hasn't distanced himself enough from Rev. Wright, who is claimed to be close to Farrakhan, is no more than guilt by association. Is such association more or less damning than Mr. Hikind's past association with Meir Kahana's militant Jewish Defense League and various other controversial settler groups? I would guess Mr. Hikind is simply trying to do more of the same ignorant fearmongering about Obama that we have seen recently from other members of the Jewish community. The NYT covers the concert ban I posted about here. Sheya Mendlowitz, the concert’s producer, said Mr. Friedman and Mr. Shor had known about the concert for months but had acted without warning, just two weeks before the show, causing $700,000 in losses. Regardless of how deeply these Rabbanim felt about the impropriety of the concert, if the allegations above are true, and those behind the ban knew full well the inconvenience that canceling it so late in the game would cause to so many, there's really not much excuse for waiting until the event had drawn so close to kick up a fuss. None. “In all my 26 years of representing this community, I can’t remember anything that has so shaken the people,” Mr. Hikind said on Sunday. Uh...I can think of a few. The Crown Heights riots? 9/11? Talk about an exaggeration on Hikind's part. Another bone to pick with the story - the reporter discusses "Mr. Shor" - aka Rav Avrohom Schorr - one of the Yeshiva world's most prominent Rabbis, yet manages to bestow the honorific of "Rabbi" to the radio personality Zev Brenner, who calls himself Mr. Brenner in his own bio. A minor point, to be sure , but it shows how quickly and carelessly this story was cobbled together. All in all, not our finest moment. On the heels of one local Rabbi who made what can be misconstrued as an inappropriate comment regarding Barack Obama a few weeks back, another local Rabbi really went to town on the candidate in shul today. In a diatribe that, according to my unofficial polling, many congregants present found completely improper, he went off on Obama in a completely over-the-top fashion. The Rabbi criticized Obama's position Israel, and said he surrounds himself with Sonei Yisrael (haters of Jews) and Sonei Eretz Yisrael (haters of the land of Israel). The Rabbi compared Mr. Obama to Haman, to FDR (that people loved FDR too and didn't realize what a Rasha he would turn out to be), and in what should really just invoke Godwin's Law, he actually compared the man referred* to... Hitler himself (that people dismissed Hitler too as just being all talk). Now, I don't believe at all that Obama is anti-Israel. I just don't. Aside from these compelling arguments (I, II, III), I just refuse to believe that the candidate has ulterior motives regarding Israel based solely on a whisper campaign regarding false claims about Obama being Muslim - as opposed to on his good record on Israel issues. I had a conversation with a very intelligent and well-read family member who completely believed the forwarded e-mail she received that claimed that Obama is Muslim (false), was sworn into office on a Koran (false), and she even went so far as to call me out as being "naive" for not believing those claims, and for not seeing as clearly as she does that Obama is nothing more than a Trojan horse for terrorists. It was truly painful. But all things considered, not as painful as a religious leader making such claims from the pulpit in front of a captive shul-going audience. That's just plain wrong. *UPDATE: Edited to concede a valued commenter's point that it was not a direct comparison between Obama and Hitler, but a reference (though clearly a reference inviting a comparison). As opposed to last week's screed against Jewish music concerts, this is a ban I can wholeheartedly get behind. I lived in Israel for a time, and I will never forget the sight on Purim day of Charedi adolescents smoking cigarettes all over Jerusalem. Smooth-faced young boys were dragging away on cigarettes at every street corner. In certain Israeli Charedi circles it's almost as if allowing adolescents to smoke is one of the positive commandments of the Purim holiday - almost as widespread as the widely kept Purim "mitzvah" of drinking enough to vomit all over the sidewalk. We can only hope a Rabbinic ban on underage drinking on Purim is soon to follow. Reading about the recent Jewish music concert ban and the resulting cancellation of a widely promoted upcoming Jewish music concert in Madison Square Garden made my head spin. How did this happen? I mean, I know that a similar ban had gained foothold in the Israel Charedi world - but for some reason I thought things were different here. There are also apparently members of the Israeli Charedi community who seem to find it appropriate to spray women dressed in clothing deemed inappropriate with bleach, or get violent with a woman sitting at the front of a public bus. I guess I should have paid closer attention to the warning bells going off in the back of my brain. After all, recent events have brought us a boycott over headshots of women displayed in a storefront on a main public thoroughfare, and calls for elementary school Rebbes to stop playing ball with their Talmidim - we've even graduated to rioting over in the ostensibly more mixed Charedi neighborhood of Boro Park (before you disagree, remember that in BP, as compared to the Israeli Charedi neighborhood of Bnei Brak, men and women still shop in the same stores and walk on the same side of the street, and restaraunts in BP still seat groups of men and women eating together). But I can still admit to being shocked that views that I consider to be so extreme have started to affect my world. Do I expect a Jewish music concert ban to come to the more moderate Yeshivish/Charedi Lite segment of the Five Towns any time soon? Well, no... but I am starting to worry that the possibility might not be as implausible as it seemed just a few years ago. I know locals who had planned to take their kids to the now-canceled concert in question - their kids were (almost) as excited for the concert as the multitudes of shrieking tween girls I saw lined up in a news story about a Hannah Montana concert. I'm not suggesting that Orthodox Jews need our own version of Hannah Montana, but I am suggesting that kids need an outlet that allows them the opportunity to have some fun and let off some steam. ...the text of the ban was identical to that of a ban enacted in Israel last year, which succeeded in shutting down a joint performance of Mordechai Ben David and Avrohom Fried. It included references to Israel and called for a complete end to Jewish music concerts. That made it unclear if the document was intended to apply only to the Madison Square Garden event, or if American Charedi rabbonim intended to follow the lead of Israeli colleagues and enact a sweeping prohibition against Jewish music. "Lean on Me" - circa 2008? No matter how benignly expressed, I feel that the opinion that Mr. Waronker was not fit for a job due to his religious views is nothing short of veiled discrimination. The excuse that it was simply a realistic view of the situation is obviously belied by the success Waronker has seen at his post. Um, is this what passes as hard-hitting journalism these days? A quote that shows that there are people who feel perfectly comfortable being quoted, by name, as believing that old canard about Jews and money - while the paper asserts that such bigotry is nothing more than "suspicion" based on the woman's "upbringing"? Is there any way, shape or form that had this comment been made by an Orthodox Jew, spewing racist or discriminatory stereotypes about another minority group, that it would have been buried in the middle of the story as a perfectly reasonable "suspicion" instead of actually being the story? Perhaps some of that extreme political correctness that seems to be going around could be applied across the board? Maybe? Either way, these two minor quibbles should not take away from the spirit of acceptance and harmony in which this story should be read. Regardless of the low expectations that appear to have been shared by so many regarding both Mr. Waronker and the students of JHS 22, they seem to have together defied the conventional wisdom in their district and achieved, in a scene out of some 2008 version of Lean on Me - starring Matisyahu instead of Morgan Freeman as the embattled but ultimately successful principal - real progress. I wish both students and principal more of the same continued success in the future. What do a deaf woman in Los Angeles, a first-century Jewish sandal maker and a red-cockaded woodpecker have in common? I recommend reading the column to find out - as well as to catch how the Shemita-year device of Heter Mechira figures into the discussion. Though their point - that every action can incur all manner of unexpected results - might seem obvious, it doesn't make reading about some specific unintended consequences any less interesting. They make an interesting point. When the Shemitta-year law of forgiving all debts created a situation in which those who needed loans were being refused in pre-Shemitta years, thus harming those (the poor) who most needed the reprieve ostensibly offered by Shemitta, Hillel instituted a system whereby that unintended consequence could be averted. However, while the law of Shemita that commanded that all fields must lie fallow may have allowed poor Jews living in Israel to help themselves to produce during that year, the similar though admittedly far more recently instituted Heter Mechira has not at all been accepted among Charedi Jews. This has created a situation where the Charedim, some of whom number among the poorest of Israeli citizens, instead spend their meager funds on imported produce to avoid buying fruits and vegetables grown on Jewish-owned land with a Heter Mechira - or worse, these families are forced to go without much in the way of fresh produce altogether. Now, the fact that that individual Halachot might have unintended consequences is far from a Chiddush. I think it's fair to state that just about every law - whether religious or secular - will have some unintended or unplanned-for consequence. Nor should that fact necessarily be a criteria to attempt to change normative Halacha. That said, there is a halachic concept of considering the societal or financial fallout of a psak before rendering it. I have personally seen such a practice in action, when in a situation that forced me to ask a Shaila of a quite eminent Rav regarding the need to replace a certain kitchen appliance that had been rendered unkosher. When I posed the question to the Rav, his first ruling was that we were required to replace a certain component of the appliance only, as opposed to the entire appliance. When I mentioned that I had researched the pricing and found it almost as expensive to do so as to replace the appliance entirely, he paused, told me he was unaware as to how costly the component in question was, and told me to call him back later that evening after he did some research. When I called back later that evening he had decided on a more lenient ruling, and told me how to perform a technique to kasher the appliance instead of replacing the component or the appliance entirely. At first blush, that might seem to be a cop-out of sorts, a less than strict adherence to Halacha in the face of what might have amounted to a bit of financial discomfort. But clearly this very learned Rav felt comfortable amending his ruling based on the hardship a stricter ruling might cause. I should probably add, however, that the same Charedim who do not hold of Heter Mechira might very likely not hold of the ruling I received regarding my kitchen appliance. I will also add the the usual disclaimers regarding how one ruling has absolutely nothing to do with the other aside for the seeming differences in flexibility when it comes to the question of a strict adherence to halacha when it imposes financial hardship. Some might also find it interesting that the very same Rav who gave me my kitchen appliance psak does not approve of eating produce grown with Heter Mechira. So in the interests of full disclosure, I must note that the OrthoFamily ourselves do not purchase Heter Mechira fruits and vegetables. Much is being made of the scheduling of Nevada's presidential caucuses on a Saturday, which affects observant Jews as well as Seventh Day Adventists. I can't begin to imagine a scheduling conflict like this ever occurring in a state with a sizable population of observant Jewish voters such as New York or Florida, in contrast to the state of Nevada, whose numbers of observant Jews is relatively tiny - and if it did happen in one of those states, I'm quite sure the Orthodox groups would have sued or initiated some action over being flat-out precluded from voting. The real problem here is that the caucus system of voting, in contrast to the primary system most states utilize, precludes any voting not done in person at the designated time. So whereas Sabbath-observant voters in states with Saturday primaries can either vote by absentee ballot or get to the polls after sundown, in Nevada Sabbath-observant voters are completely disenfranchised. Certainly an upsetting development for those who actually prefer to have their voice heard as citizens. There seem to be some other complaints about the Saturday choice for the caucuses, from casino workers who quite obviously need to be at work during the entertainment industry's peak weekend shifts. This concern led to the establishment of special voting stations to accommodate casino workers and allow them to vote. This in turn drew calls from Clinton supporters that these special voting stations unfairly favored Obama as he had been endorsed by the influential culinary workers union, many of whose members work in casinos. A lawsuit to put an end to the voting stations was filed (and lost). Interestingly, the group who mounted the failed challenge to the special voting stations is comprised of members who are least disenfranchised by the Saturday caucus - a teachers' union who generally have weekends free and clear. Obama and some of his supporters, in turn, are criticizing the Clinton camp for attempting to effectively disenfranchise voters with this legal challenge - a challenge that would seem to have had far more potential to affect the vote than the Orthodox/Seventh Day Adventist issue will have. Sounds like a lot if controversy over voters' rights in Nevada - not a pretty way to start off what looks like it promises to be a contentious election season. A friend handed me Naomi Ragen's latest, The Saturday Wife, last week, and I figured it would be worth a read - as her other efforts have proven in the past. I was wrong. I am an avid reader, and I read quickly enough that I rarely find a book to be a complete and utter waste of time. This book, however, fits that bill. I finished reading it only because I was so fascinated by how unlikeable and caricatured the characters were and how ridiculously predictable and uncompelling the story line, that it was akin to rubbernecking at a train wreck. The weak ending didn't disappoint either. All in all, highly NOT recommended. Don't let anyone anyone convince you that this book is worth reading, if only because it's set in the Orthodox Jewish world. It isn't worth reading. I'd have been better off keeping up with my delinquent blogging that reading this book, that much is certain. This article in yesterday's NYT raises some interesting issues regarding the changing demographics of Lakewood, NJ. The township has witnessed exponential growth in its Orthodox population, and with that growth, an increase in tensions between town residents. In some ways, the tensions described are similar to the resentment that seems to occur whenever a locale goes through a significant demographic change, in other ways the situation is unique to those areas that have seen themselves being increasingly populated by Orthodox Jews. Few other demographic groups move into communities en masse with the intent to create and patronize their own schools, places of worship, eateries and stores. Even if such de facto self-segregation is not the intention, but just the byproduct of practices that are intended to preserve traditional and religious standards, articles such as this one, that highlight the negative sentiment that can arise in such situations (much like the situation here in the Five Towns), should serve as a reminder that the Orthodox populations in such areas should make every attempt to assuage the negative sentiment that seems to arise wherever they create communities that give the impression of isolationism. Making inroads and exploring ways to get along with those who are different can certainly only help cool simmering tensions - whether here in the Five Towns, in Lakewood, or in any other community staring down the barrel of a sudden demographic shift. There have been fights about the administration of the school system. Orthodox Jewish students attend private schools, but are eligible for millions of dollars of public money for busing, according to the town’s current mayor, Ray Coles. Black residents have complained that decisions about public schools attended largely by black and Hispanic students are made by a school board where 5 of the 9 members are Orthodox Jews. Warren A. Sherard, the head of the local N.A.A.C.P. branch, said he had tried to get black residents more invested in the politics of the town. One point I feel I must make is that there is absolutely nothing wrong, or sinister, or untoward about the fact that, as the Times puts it, "Orthodox Jewish students attend private schools, but are eligible for millions of dollars of public money for busing". Busing is absolutely the right of every district resident, no matter where that child attend school. The implication on the part of the NYT that this complaint against the private school residents somehow actually holds water is irresponsible. Another interesting point that is directly relevant to tensions in my district is the issue of the local school board holding a majority of non-public school parents. In Lakewood, as in the Five Towns, it may be difficult for some district residents to see a school board controlled by members who largely do not send their children to district public schools, but as Mr. Sherard noted in the quote above, the best way to fight that is to get out the vote for the candidate you support. I urge everyone to read this great post by Gil, where he respectfully takes apart some statements made by by Agudah spokesman Rabbi Avi Shafran on the subject of child molestation. I agree with Gil's overall point. In my opinion, Rabbi Shafran is spending too much time explaining and obsessing on how Orthodox Jews are the victims of the media, and how our culture is under siege by people hell-bent on proving that the molestation issue is as prevalent in the Orthodox community as it is in society at large - and in doing so, Rabbi Shafran is completely dodging the issue here, an issue which sorely needs addressing. The issue that child molestation does exist in our schools, in our camps, in our neighborhoods. The issue that every single allegation of child molestation needs to be fully and thoroughly investigated. The issue that there are too many instances coming to light of people in our community turning a blind eye - whether out of ignorance or out of willful denial - to the cases of abuse that have seemingly occurred. Is Rabbi Shafran correct that every allegation cannot automatically be treated as fact, and that there needs to be a some sort of balance to the wholesale panic and hysteria that can ruin lives if left unchecked? Yes. Is that the point that needs to be driven home? Perhaps - but it is certainly not the most important point to be made on this subject, and certainly not the point that needs to be made every single time Rabbi Shafran addresses the topic. It's almost as if Rabbi Shafran would have us believe that the fear of the community losing face over these allegations is somehow anywhere near as disturbing as the allegations themselves. The allegations, some quite credible, of children being abused in the most heinous manner by those who we entrust to care for them, to educate them. If Rabbi Shafran were to put out just one statement that would lead me to to believe that he is chagrined, devastated, completely emotionally wrought by the allegations of abuse and cover-up that have rocked the Orthodox world, then maybe I would feel more comfortable with the apologetics and attempts to paint the community at large as the actual victims of unfair media attention here. But the bottom line is that the victimhood is getting old. The victim here is not the Orthodox community, at the hands of a sensationalist press - or at least they are not the most pitiable victims. The victims, that just once, Rabbi Shafran might consider showing at least as much compassion for as he does for the reputation of our entire community, are...well, the actual victims of these heinous crimes. Is Rabbi Shafran trying to enable child molesters? Is he truly looking to be complicit in the culture of cover-up that permeates our community when it comes to this subject? I don't believe he is. But I think his apologetics and his tone-deaf approach to the topic are misfiring, again and again. Last week, Yeshivaworld posted an article from the Times Herald Record regarding members of the Monticello School Board who decided to boycott a School Board Event which was scheduled for the first night of Chanukah. One board member told the Record that “it was inappropriate to hold a meeting during the family-rich first night”. BOCES Superintendent Martin Handler said that this was a scheduling mistake, and that it didn’t occur to anybody that the evening of December 4th was significant. The meeting will be held sometime in January. I'm pleased to see that the district took into account the sensitivities of the board members who felt they were being unduly inconvenienced by the scheduling conflict. Go Directly to IVF - Do Not Pass Go? So it makes sense that some researchers are pushing to skip the middle step and go straight to IVF when the first-round effort fails. In a study presented last month at the annual meeting of the American Society of Reproductive Medicine, doctors from Dartmouth Medical School and Boston IVF concluded that women who were fast-tracked to IVF got pregnant three months faster on average, and spent $10,000 less than those who went through the usual preliminaries. Shorter waits bring welcome psychological relief. One study claimed that women going through infertility treatment were as distressed as women diagnosed with cancer, heart disease, or HIV. Fast-tracking can mean fewer episodes of dashed hopes. That could lead to less depression, anxiety, and stress, which hurts marriages and, some claim, may lower one's chances of conceiving. Another reason seemed to be because her Rav was concerned about the supposed higher rates of multiple births with IVF, and the fact that such multiple pregnancies entail a higher risk for both mother and children - however, that IVF does have a higher propensity for multiple births seems to be disproved from the study noted above. The first is the potential to prevent higher-order multiple births—triplets, quadruplets, and beyond, which carry a greater risk to the mother's and babies' health. Women who get pregnant from injections with insemination face a 10 percent to 15 percent chance of carrying litters because the drugs can make them release six or more eggs. There's no way to control how many get fertilized. With IVF, by contrast, doctors create embryos in a lab and choose how many to transfer back to the womb, bringing the risk of triplets and beyond down to 2 percent to 4 percent. (The odds of conceiving triplets naturally are between 1 in 6,000 and 1 in 8,100.) That IVF figure is likely to decline further as doctors increasingly transfer fewer embryos. So the question is, will the halachic recommendations change as a result of these findings, as the medical recommendation is hopefully going to - if they haven't already? Feel free to chime in with your experience as to whether halachic guidance given to infertile couples jibes with this medical recommendation to fast-track IVF. Though I know a few people who received halachic guidance to wait on IVF until other treatments have been tried, I know of at least one friend, living in Israel, who received a psak to go straight to IVF - but that obviously might have been complicated by her specific situation. So I'd love to hear some weighing in - anecdotal though it might be - on what seems to be the halachic consensus at this moment. More on halacha and infertility here, from the indefatigable Chana's excellent notes from a medical ethics conference she attended at YU. It has been 62 years since deaf and mute Irena Walulewicz risked her life to save a Jewish neighbor from the Nazis, but her heroism was never forgotten. "I've thought about her so much," Golda Bushkanietz said tearfully as she hugged her savior for the first time since 1945 at Kennedy Airport Friday. "I'm 94. I never thought I would see her again. I cannot fully express how grateful I am." Desperate and terrified, Bushkanietz staggered into the Walulewicz household in Swieciany, Poland, after escaping a ghetto whose population the Nazis were preparing to kill. "I knocked on a window and they let me in," said Bushkanietz. "I thought there was an angel in the house." For six months, the Catholic Walulewicz and her mother, Zofia, hid and fed Bushkanietz in their attic. "I still remember lying under Irena's bed, trying to keep quiet because the family had friends in their house," said Bushkanietz. "They opened their home and their hearts to me, risking their own lives in order to save me. Their altruism and bravery is what has allowed me to live and build a wonderful family of my own." "I knew it was dangerous. I knew I could be killed at any time," Walulewicz, 82, said through a translator yesterday. "I'm so happy to see her again. I didn't know she was still alive." The reunion was planned by The Jewish Foundation for the Righteous. After the war, Bushkanietz reunited with her husband, who had fled the ghetto with her and had been fighting with partisans. The couple moved to Israel. They have two children, seven grandchildren and four great-grandchildren. "It's difficult for me to travel to the U.S. at my age, but to see Irena was a special treat," she said. Walulewicz, who still lives in Poland, kissed Bushkanietz's son and grandson, who were with her yesterday. "None of us, the whole of our family, could be here without Irena's heroic acts," said Jonathan More, 26, Bushkanietz's grandson. My, neighbor, Zev Wolff, a 5-year-old boy, needs your help now. This beautiful and bright child has been battling a rare form of pediatric cancer known as Neuroblastoma since he was 3. Following nine months of intensive treatment at Memorial Sloan-Kettering Hospital (MSKH), Zev was in remission. Fourteen months later, he relapsed. Zev has had to undergo major surgery, chemotherapy and radiation; nearly a year later, Zev's scans look good. Unfortunately, Neuroblastoma has an extremely high rate of relapse. Zev needs another drug to stay in complete remission. His little body is fighting the drug 3F8 with which he's currently being treated. Currently, a new is being developed. The improved drug could help cure Zev and 300 other children with this disease. But the new drug needs to be manufactured, at a cost of almost five million dollars. Large pharmaceutical companies do not see the profit in healing only a few hundred children annually. We are appealing to you to leverage your influence, relationships and support to drive the humanization of 3F8 to benefit the several hundred children, like Zev, who fall victim to Neuroblastoma every year. When this antibody is better tolerated and more effective, and when it can be manufactured on a scale that is economical, the lives of more children will be saved from this deadly cancer. Helen and Ranan Wolff, Zev’s parents are grateful to be a part of this community. Time and time again you have shown your generosity to the Wolff family. The meals, babysitting, blood donations, words of support. Now I am asking for your generosity again. Please, open your hearts to Zev Wolff. Zev has come so far, he's been so brave and so strong. Please contact Dr. Asher Mansdorf at amansdorf@aol.com for more information on how you can help. Please do anything you can to help. Researchers presented a conundrum to new mothers on Monday, saying that women who want to lose the extra weight gained in pregnancy should try to get more sleep. "We've known for some time that sleep deprivation is associated with weight gain and obesity in the general population, but this study shows that getting enough sleep — even just two hours more — may be as important as a healthy diet and exercise for new mothers to return to their pre-pregnancy weight," said Erica Gunderson of Kaiser Permanente, which runs hospitals and clinics in California. Gunderson and colleagues studied 940 women taking part in a study of prenatal and postnatal health at Harvard Medical School in Boston. The women who slept five hours or less a night when their babies were six months old were more likely to have kept on 11 pounds of weight one year after giving birth, they found. Women who slept seven hours a night or more lost more weight, they reported in the American Journal of Epidemiology. The researchers acknowledged this may pose a dilemma to new mothers, given that infants sleep so fitfully. "With the results of this study, new mothers must be wondering, 'How can I get more sleep for both me and my baby?' Our team is working on new studies to answer this important question," said Dr. Matthew Gillman of Harvard Medical School and Harvard Pilgrim Health Care. Uh. great. I am SO glad that now that we know being up ALL NIGHT with a screaming baby might be keeping new moms from losing that baby weight may finally have scientists "working on new studies" to get babies and their mothers to sleep more. I mean, it was no problem at all for me to spend the wee hours of countless nights walking back and forth trying to comfort an alternately whimpering and howling baby in my arms - that is, until I found out that this was what might be keeping those pesky pounds from coming off. Because until now, it was perfectly bearable - even enjoyable, right? Thanks for the handy tip, Harvard geniuses! I wonder why getting more sleep didn't occur to me when I was a new mom? Us mothers will be sure to mention it to our colicky babies so that they can take their moms' weight loss needs into account before they make their evening plans! Given the option of spending the first night of Chanukah with family and friends, or going to a meeting, Monticello school board officials didn’t have to think twice - reports the Record Online. They are reportedly boycotting a Sullivan County School Board Association dinner meeting that was curiously scheduled for the night of Dec. 4, which has been on the calender for a year as the first night of Chanukah. Monticello Superintendent Pat Michel said he contacted the organizers, including BOCES Superintendent Martin Handler, asking them to reschedule. “They mulled it over,” Michel told the Record. Totally agreed. I think it is terribly insensitive to schedule a board meeting for the first night of Chanukah, and I completely support the Jewish board members in their plan to boycott the meeting. Christian members of the school board would never allow a meeting to be scheduled for Christmas or Easter, so it is unreasonable to expect board members of a different religious denomination to show up on a holiday that is as important to them. And for the record, I would feel exactly the same way if members of the Hindu religion were being asked to show up to a meeting scheduled for Diwali, or Muslims on Eid. This is America, and we all need to be respectful of each other's religious differences and boundaries, even if that happens to entail rescheduling a board meeting. Observing Shabbat but have to call your grandmother? Have to have a cup of coffee when you come back from weekend services? The halachic institute for science and technology has just the thing for you. A group of engineers at the halachic institute, which specializes in Halacha-friendly technological developments, has come up with several new technological breakthroughs designed to ease the religious public's life, while keeping with all Shabbat-related mitzvahs. The gadgets include, among others, a Shabbat air-conditioner, a Shabbat phone and a kosher, Shabbat espresso machine. Many of the institute's developments are already in production, both in Israel and abroad, and several have been introduced to the public at a special show arranged by the Manufacturers Association of Israel. These devices, said the MAI, have a potential $10 million a year market. "We have gadgets that are meant to make life easier, such as the coffee machine and on the other hand, we have things like the Shabbat phone, that could help people in medical need," said Dov Zioni of the halachic institute. One of the show's biggest hits was the Shabbat pen, which uses self-dissolving ink that disappears 24 hours after writing. "We're not talking about life and death situations here, when one's need to desecrate Shabbat to save a life goes without saying," added Zioni, "but for all those little grey areas we all encounter in our day-to-day lives." "The industry finally realized the financial potential of developing products specifically for the ultra-Orthodox public," Industry, Trade and Labor Minister Eli Yishai, who visited the show and was visibly pleased, told Ynet. "We get to develop different technologies, create jobs and observe Shabbat. It's a win-win situation," he added. I can't imagine that these products are going to gain much popularity in the ultra-orthodox community, as trade minister Yishai suggests in the article. I just don't see invisible ink pens or Shabbat phones making their way into Charedi homes for regular use on Shabbat and Yom Tov. That said, the gadgets would probably prove very useful in the army, or for hospital or Hatzalah use. Even though, as the article notes, using a phone or a pen isn't an issue in Pikuach Nefesh (life-saving) situations, it would be interesting to see these products in use for situations that are not clearly life-or-death. The products might also hold interest for those who are less observant, and would consider using a non-Shabbat phone or pen on Shabbat. In a case such as that, why not use one specially made to skirt the prohibitions of Shabbat? So apparently, XGH has joined the elite little club of bloggers being threatened with legal action. As the story goes, Webads placed an ad on his blog, among others, for a book written by Rabbi Eliyahu Safran on the topic of Tzniut (modesty). XGH, upon perusing the book's website, noticed that in his bio, Rabbi Safran mentioned his wife's profession as a purveyor of fine custom wigs . XGH, on further investigation, noticed that said wig company sells some wig styles that he apparently feels are not in keeping with the spirit of Tzniut, and expressed as much in a satirical post. Evidently Rabbi Safran did not appreciate the joke, and threatened both Webads and XGH with a lawsuit unless the offending post was removed. XGH refused, at which point he and Webads severed their business relationship. Should be end of the story, except that according to this comment, Rabbi Safran is apparently still threatening both Webads and GH with legal action unless the offending post is removed. A. What does Webads have to do with this anymore? It seems to me that Rabbi Safran should have no further beef with them now that their relationship with GH has been severed. And even when their relationship was intact, it isn't as if there is any understanding that Webads has any control whatsoever of the content that goes up on the blogs on which they sell ad space. They placed an ad on GH's site, he posted something Rabbi Safran did not like, Rabbi Safran informed Webads, they severed the business relationship. Sounds like the Webads chapter is closed, and that they did everything they could to deal with the issue properly. The Webads chapter of this saga should be closed. They seem to be an innocent victim in all this, and I would hate to see Rabbi Safran bully them over this when it is clear they have no further control over the situation. C. Was GH's criticism fair game? Some might say it was over the line, as it isn't as if his criticism was based on the content of the book. That said, whether or not I would have chosen to poke fun at the situation as GH did does not mean that his post topic was not fair game. Rabbi Safran did choose to put the information about his wife in his bio, and it isn't as if he mentioned that she was a seminary teacher. She deals in headcoverings, and the book is about Tzniut. Sounds like a reasonable topic to discuss, regardless of whether one agrees with GH's tone. I myself admit to being curious whether the author of a highly touted book on Tzniut endorses the wearing of glamorous sheitels named after movie actresses. Does anyone know if Rabbi Safran takes a position in his book on the propriety of various types of head coverings? I'd be interested in knowing. D. As often happens when people make a big deal of a little thing, things tend to get magnified. I highly doubt many people would have cared what Rabbi Safran's wife does for a living, and had this not become an issue, XGH's post would have been pushed down by his usual busy posting schedule, and probably quickly forgotten. Instead, this issue has been dredged up in numerous posts at XGH's, and I'm sure will be picked up by many other bloggers. Sometimes it's better to simply let well enough alone. Trust me. I know this from personal experience. I got more traffic as a result of the Greenbaum lawsuit than I had ever gotten, and all Ms. Greenbaum et al succeeded in gaining was a larger audience for my views - the very views they found so offensive and hurtful in the first place. Probably not what they were looking for. I just finished a quick but well-written book over the weekend that I thought I would recommend to my readers. The title is Not Me by Michael Lavigne. The story is told from the vantage point of Michael, a middle-aged Jewish comedian, separated from his wife and son, and tending to his dying father. His father, who has always presented himself as a Holocaust survivor, hands Michael a box of journals which contain some writings with some pretty stunning clues as to the man's wartime activities, which leaves Michael struggling to connect the dots as to the truth about his father's past. The journals recount the story of a Nazi accountant who worked in a concentration camp, and then manages to escape the Allies at the end of the war by impersonating a Jewish Holocaust survivor and emigrating to what was then Palestine. The narrative is complicated by the question of whether the journals are works of fiction, or his father's actual memoirs of his experiences during the wartime years, and the story works through the confusion from the son's perspective nicely. What's interesting is how the author, in telling the story, seems to blur the line between victim and perpetrator until the reader's sympathies become a bit mixed up - and I am quite sure that that is not entirely a good thing when it comes to the subject matter at hand. Though one certainly feels some sympathies toward the father in the novel, and the author certainly works hard to make the point that there is a large gray area between what's "right" and what's "wrong", as well as how subjective the concept of identity can be, it was hard for me to see the father as having been an altruistic character, despite him being portrayed as being a devout Jew and having been involved in many Jewish causes in later life. That said, I would obviously never suggest that every literary work has to have some sort of moral message - so the book is still worth a read even if I can't empathize with some of the characters as the author seems to expect us to. The book also includes some interesting tensions between three generations' worth of father-son relationships. The book actually reminded me of a different book I had recently read, Those Who Save Us, which tells a similar story of a grown child uncovering some long-buried secrets regarding a parent's wartime activities - in this case, a daughter about a mother. In terms of the actual secrets being uncovered, the author of this book does not have to work as hard to blur the line between victim and perpetrator - the mother of the main character is clearly a victim, despite her wartime activities in which she has an affair with a Nazi officer out of self-preservation - as well as a hero - in her own right, as compared to the father in Not Me, who I cannot characterize as showing any heroism throughout the book. Also, in Those Who Save Us, though the mother is portrayed as a sympathetic character, there is no attempt whatsoever to mitigate the evil in the portrayal of any Nazi sympathizers or Nazis proper, as there is in the pages of Not Me. All in all, both books are worth picking up, though I wouldn't recommend reading them back-to-back, as the similarity in themes might get a bit repetitive. If anyone has read either/both of these books and would like to treat this thread as an impromptu book-club meeting, feel free. I would be happy to join in.